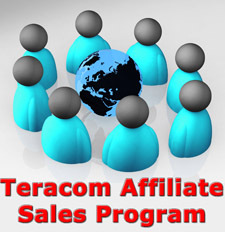 Telecommunications Training Blog – Page 6 – Tutorials and articles from Teracom Training Institute. Bringing you the best in telecom training and certification since 1992. The Internet connection at your office dies. Lights on your modem are flashing in a strange pattern. You call the ISP, and they quickly diagnose that the modem power supply has failed, and they will overnight you a replacement. Presumably you are not the first person to have this problem with that modem. So how do you continue to operate while you are waiting for the replacement power supply? It’s hard to run your business without e-mail and ordering and administration systems, which are all accessed via the Internet. Regional Rings, POPs and MANs”, slide 3.17 of Course 101, Telecom Datacom and Networking for Non-Engineering Professionals, and mention it in pretty much every other course. A large business will be a station on a Metropolitan Area Network, which is a ring, meaning two connections to the Internet for that business and automatic reconfiguration in the case of one failing. But this is expensive… the second connection is not free. Small and medium businesses usually have a single DSL or cable modem connection to the Internet. When that fails, connectivity to email, ordering and administration servers is impossible, and many businesses these days would be “dead in the water” until the ISP fixes the problem with their hardware. Unless you have an Android smartphone, a good “data” plan and a laptop with WiFi running Windows. The scenario described happened at our office last week. Since many of our customers might find themselves in a similar situation – even at home – I thought I’d share the quick and painless solution I came up with. Even if you’re not likely to need this solution, understanding how it works will no doubt sharpen your understanding of the devices involved and their functions. In this tutorial, I will use the technology in our office: 16 Mb/s DSL, Android smartphone and Windows laptop. The solution is equally applicable to an Internet connection using a cable modem or if you are one of the lucky few, an Internet connection via fiber. For the smartphone and laptop, there may be equivalent functions on Apple products, but as I am allergic to Apples, we don’t have any in the office. I’m posting this tutorial on our Facebook page, our Google+ page, or our blog; I invite someone better able to tolerate Apple products to leave a comment whether and how the iPhone and MacBook can perform the required functions. 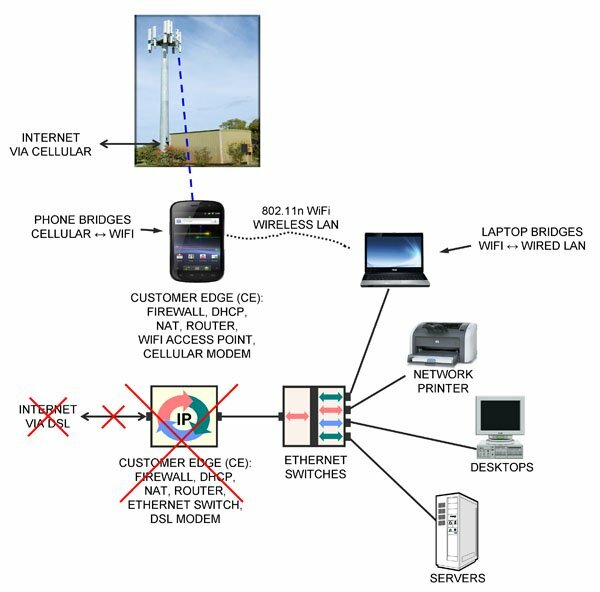 Figure 1 illustrates the normal network setup in our office, a typical configuration for networking at a small or medium business. On the left is the access circuit to the Internet Service Provider (ISP), terminating on a modem in our office. The modem is contained in a box that also includes a computer and an Ethernet switch. This box is more properly called the Customer Edge (CE). The computer in the CE runs many different computer programs performing various functions: Stateful Packet Inspection firewall, DHCP server offering private IP addresses to the computers in-building, DHCP client obtaining a public IP address from the ISP, a Network Address Translation function between the two, routing, port forwarding and more. In-building is a collection of desktop computers, servers and network printers. These are connected with Category 5e LAN cables to Gigabit Ethernet LAN switches, one of which is also connected to the CE. 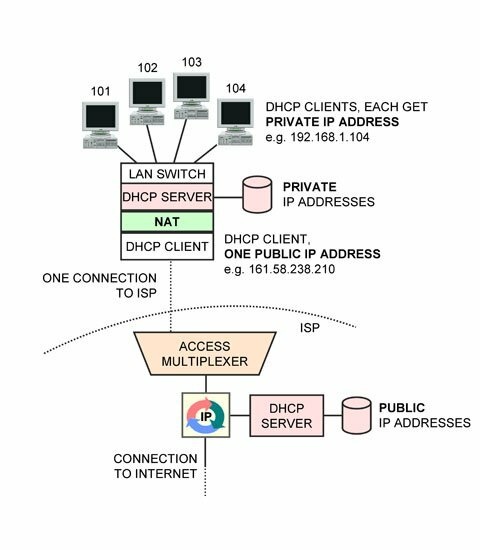 When a desktop computer is restarted, its DHCP client obtains a private IP address and Domain Name Server (DNS) address from the DHCP server in the CE. The private address of the CE is configured as the “default gateway” for the desktop by Windows. When a desktop computer wants to communicate with a server over the Internet, it looks up the server’s numeric IP address via the DNS, then creates a packet from the desktop to the Internet server and transmits it to its default gateway, the CE. The NAT function in the CE changes the addresses on the packet to be from the CE to the Internet server and forwards the packet to the ISP via the modem and access circuit. The response from the Internet server is relayed to the CE, where the NAT changes the destination address on the return packet to be the desktop’s private address and relays it to the desktop. The solution for restoring Internet access after the CE died is illustrated below. An Android smartphone and a laptop running Windows were used to restore connectivity to the Internet without making any changes to the desktops, servers or network printers. First, I took my Samsung/Google Nexus smartphone running Android out of my pocket and plugged in the charger. Then on its menu under Settings > more > Tethering & portable hotspot > Set up Wi-Fi hotspot, I entered a Network SSID (“TERACOM”) and a password, clicked Save, then clicked Portable Wi-Fi hotspot to turn it on. The smartphone is now acting as a wireless LAN Access Point, just like any other WiFi AP at Starbucks, in the airport or in your home. At this point, the smartphone is the CE device, performing all of the same functions that the DSL CE device had been before it died: firewall, DHCP client to get a public IP address from the ISP (now via cellular), DHCP server to assign private IP addresses to any clients that wanted to connect (now via WiFi), NAT to translate between the two and router to forward packets. Just as the DSL CE equipment “bridged” or connected the DSL modem on the ISP side to the Ethernet LAN in-building, allowing all the devices on the LAN to send and receive packets to/from the Internet via DSL, the smartphone “bridges” or connects the cellular modem on the ISP side to the WiFi wireless Ethernet LAN in-building, allowing all the devices on the wireless LAN to send and receive packets to/from the Internet via cellular radio. The remaining problem was that none of the desktops or servers had wireless LAN cards in them, so they could not connect to the smartphone AP and hence the smartphone’s cellular Internet connection. What was needed was a device to “bridge” or connect the wired LAN to the wireless LAN in-building. By definition, this device would need two LAN interfaces: a physical Ethernet jack to plug into the wired LAN, plus a wireless LAN capability. Looking around the office, I spotted two devices that fit this description. One of them was my laptop, with both a LAN jack and wireless LAN. I fired up the laptop, plugged it into an Ethernet switch with a LAN cable, and in the Network and Sharing Center, clicked Change Adapter Settings to get to the Network Connections screen that showed the two LAN interfaces. I enabled both the wired and wireless LAN interfaces. Then right-clicking the Wireless Network Connection icon, selected the TERACOM wireless network and entered the password. Once that was successfully connected, I selected the two adapters in the Network Connections screen, right-clicked and chose “Bridge Connections”. A message saying “Please wait while Windows bridges the connections” appeared, then an icon called “Network Bridge” appeared, and after a few seconds, “TERACOM” appeared as well. My laptop was now acting as an Ethernet switch, connecting the wired LAN to the smartphone’s wireless LAN. Each of the desktops, servers and network printers in the office had to be rebooted so they would run their DHCP client again, obtaining a private IP address and DNS address from the smartphone AP, and be configured so the smartphone was the “default gateway” in Windows. After rebooting my desktop computer, it had Internet access over the wired LAN, through the wired Ethernet switch to my laptop, to the smartphone via WiFi then to the ISP over cellular. After rebooting the other desktops and servers, all had Internet access again, with no changes to the configuration of the desktops or servers. This took about 20 minutes to get up and running, and we were back in business. Running a bandwidth test on speedtest.net, I found we had exactly 5 Mb/s connection to the Internet via cellular. Obviously my cellular service provider limited the connection to 5 Mb/s in software – but who’s complaining? 5 Mb/s is more than three times as fast as a T1, which cost $20,000 per month when I first started in this business 20 years ago. Note 1: You must verify your billing plan for “data” on your cellular contract before doing this. I have 6 GB included, which means basically unlimited, and that includes the WiFi hotspot traffic. Make sure you have something similar, to avoid receiving a bill for $10,000 for casual “data” usage. Note 2: As always, this tutorial is provided as general background information only. We do not guarantee it will work for you. Each situation is unique and requires professional advice to identify and resolve issues including but not limited to performance and security. This tutorial is not professional advice. But I hope you have found it valuable. Note 3: I might have been able to implement this without the laptop. If you’d like to know that, or what was the other device I could have used to bridge the wired and wireless LAN in-building, or suggest how this could be done with Apple products, please leave a comment. Happy birthday IP version 6 – you finally arrived! World IPv6 Launch Day was June 6, 2012 (about 12 years later than originally planned). Hundreds of companies permanently enabled IPv6 protocol stacks on their servers on June 6, allowing the small percentage of devices (primarily Android smartphones) that had applications, operating systems and carriers all supporting IPv6 to communicate IPv6 packets end-to-end. The address fields in IPv6 packets are 128 bits long, meaning 2 to the power 128 addresses. This is a number beyond human comprehension. Forget about questions like “how long is eternity going to last for”, “how far is it to the other side of the universe?”, “what happened before the Big Bang”, “where did all that energy come from in the first place?”, “who is God’s God?, and “who is God’s God’s God?”; we humans are not capable of understanding 340,282,366,920,938,463,463,374,607,431,768,211,456. “First I had to decide what ‘square inches of the Solar System’ meant. I decided to use the surface area of all the planets in square inches. That didn’t even come close to the number of IP addresses in IPv6. “The most commonly quoted number of stars in a galaxy is 100 billion and the most commonly quoted number of galaxies in the Universe is 100 billion. Assuming there are 10 planets around every star, then there are 10 x 100 x 100 billion billion planets in the Universe. After reading Richard’s story again recently, I figured I had better verify the last claim, so I asked Richard to calculate the number of square inches on the sphere that encloses the solar system out to Pluto and divide that into 2**128. It turns out my embellishment was not wrong: there are 5 millon addresses per square inch on the sphere that encloses the solar system out to Pluto. Hope this all helps you grasp the number 340,282,366,920,938,463,463,374,607,431,768,211,456. As a sneak preview, this newsletter’s free tutorial is part of Lesson 11 “TCP/IP over MPLS” from that course. NOTE: You may find this tutorial a bit overwhelming, landing smack on your computer screen with no preparation, like a parachutist whose chute didn’t open landing in a cow field. 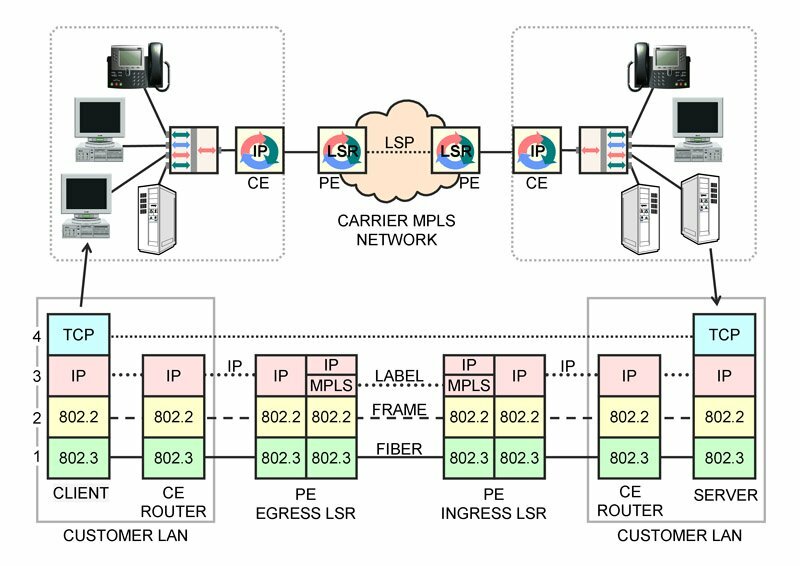 In the Online Course “MPLS and Carrier Packet Services”, there are TEN lessons building up to this one. We’re actually going to be recommending at least two modules: “The OSI Layers and Protocol Stacks” and “IP Packet Networks, Addresses and Routers” as prerequisites… so that would be at least THIRTY-FIVE lessons building up to this one. So… if you are already familiar with the OSI Layers and protocol stacks, and IP packets and LANs, you’ll find the following lesson easier to follow. Video Tutorial VT-3 “Packets, Frames, Addresses and Routing”, Video Tutorial VT-4 OSI Layers: The FedEx Analogy, and the “Datacom and Networking Fundamentals” section of our free online tutorials. The tutorial is part of the text and one graphic from Lesson 11 “TCP/IP over MPLS”. The Online Course when released at the end of March will have extensive animations following along with a voiceover of the text. Enjoy! In this course, we concentrate on the fundamentals of IP packet networks, routers and IP addresses. First, we’ll recap channelized TDM and its limitations, then understand statistical TDM or bandwidth on demand. Next, we’ll understand how routers implement the network with packet-switching, that is, relaying packets from one circuit to another, and how routers are a point of control for network security. We’ll introduce the term Customer Edge (CE). Then we’ll cover the many aspects of IP addressing: IPv4 address classes, dotted decimal notation, static vs. dynamic addresses, DHCP, public vs. private addresses, Network Address Translation, IPv6 overview and finish with IPv6 address allocation and assignment. 9. Network Address Translation watch now (free) new tutorial! The objective of this course is to develop a solid understanding of IP. After taking this course, you will be up to speed on the fundamental principles of packet networks: bandwidth on demand, also known as overbooking or oversubscription, and packet forwarding. You will know the IP packet format and how IP addresses are allocated, assigned and displayed. You will know the difference between static and dynamic addresses, public and private addresses and how Network Address Translation works. An additional objective is to become familiar with the basics of IPv6. The concept of statistical multiplexing, also known as oversubscription, overbooking and bandwidth on demand, why and how it can be implemented and its benefits. The types of IPv6 addresses, how IPv6 addresses are allocated to ISPs then assigned to users, and how each residence gets 18 billion billion IPv6 addresses. Lesson 1. Course Introduction (this one). We’ll review the idea of channelized Time-Division Multiplexing, what channels are, and how they can be used to aggregate traffic onto a high-speed circuit. Then we’ll raise some questions: is that an efficient way to connect devices that produce traffic in bursts, which means devices that are normally doing nothing? And what about the problem of a single point of failure for all the aggregated traffic? Subsequent lessons explore the answers to those questions. Lesson 3. Statistical TDM: Bandwidth-on-Demand. In this lesson, we’ll understand how circuits that move bits constantly can be used efficiently when the user’s traffic profile is: “idle most of the time, interspersed with bursts of data every once in a while.” The answer is overbooking. This is also called statistical multiplexing and bandwidth-on-demand, and is a key part of a packet network: the internal circuits are heavily overbooked, to give users the highest speed at the lowest cost. It is necessary to know the users’ historical demand statistics – also called their traffic profile – to know how much to overbook, hence the term statistical multiplexing. Lesson 4. Private Network: Bandwidth on Demand + Routing. The purpose of this lesson is to expand the discussion of the previous lesson to include multiple circuits. The result is called a private network, and is the simplest framework for understanding routers, routing, network addresses and bandwidth-on-demand. 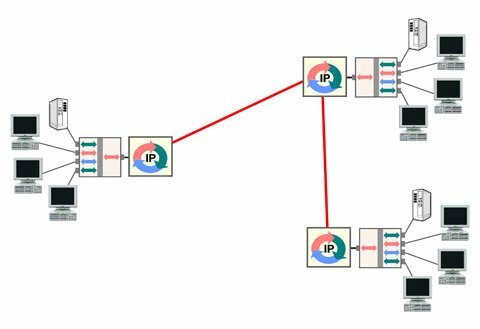 In this lesson, we’ll take a closer look at a router, more precisely identifying the functions a router performs to implement a packet network, and understand how a router routes by examining the basic structure and content of a routing table. We’ll also understand how the router can act as a point of control, denying communications based on criteria including network address and port number, why this is implemented and its limitations. The term Customer Edge (CE) is defined in this lesson. Here, we’ll understand IPv4 addresses, address classes and the dotted-decimal notation used to represent them. In this lesson, we’ll cover DHCP: the Dynamic Host Configuration Protocol, and understand the mechanism by which a machine is assigned an IP address. We’ll also understand how the “dynamic” host configuration protocol can be used to assign static addresses to machines and the advantages of this method. The purpose of this lesson is to define the terms “public” and “private” IP address, review how IP addresses are assigned and the costs for those addresses, then cover the ranges of IPv4 addresses that are used as private addresses, and understand how and why they are used. In this lesson, we’ll explore how private IPv4 addresses used in-building and a public address required for Internet communications can be joined together with a software function called Network Address Translation. Completing this course on IP, we’ll first review the next generation of IP: IPv6, understand the improvements compared to IPv4 and review the format of the IPv6 packet and its header. Finally, we examine the structure of the 128-bit IPv6 address, review the different kinds of IP addresses, the organizations that allocate them, and the current plans for how addresses will be assigned to end users… and how every residence gets 18 billion billion IPv6 addresses. Waiting for a flight at the airport. Time on my hands, I try out a feature included with the Android operating system on my new Samsung Galaxy: create an 802.11g Wireless LAN (WiFi) base station on the phone. This WiFi network is automatically bridged inside the phone to the Internet connection provided by the cellular carrier. Easy step-by-step instructions were included on the setup screen. Fired up my laptop and found the WiFi network and connected no problem. In fact, I sent a post to Google’s servers over the very link! Bonus: your car can now be a WiFi hotspot! You could even get a WiFi hotsopt logo sticker and put it on your back window, like Greyhound… On a long car trip with my family, all of whom have WiFi enabled iPhones, iPods, DSs etc. etc., I can tell them the WiFi password, and they can share my internet connection. Double bonus: If the kids start squabbling, I can threaten to turn it off! btw, I have 6 GB/month in my plan, so not so worried about usage-based pricing for the connection. Best check your billing plan before trying it.